We run homes that specialise in caring for people with dementia. Our staff have specialist training so they can support people with dementia, and help their relatives and friends play a full part in their lives. The word dementia described a set of symptoms caused when the brain is damaged by diseases. These symptoms include memory loss, problems with thinking, problem-solving or language. It is a progressive condition, so changes over time and gradually gets worse. We employ dedicated dementia specialists and staff who are able to work with residents so they have the best quality of life. We work with external medical experts and doctors to ensure the needs of our residents with dementia are always considered. We support the use of specific therapies and care techniques, set down in personal care plans, to compensate for the loss of abilities caused by dementia. Supporting people with dementia, with dignity and respect, is central to what we do. 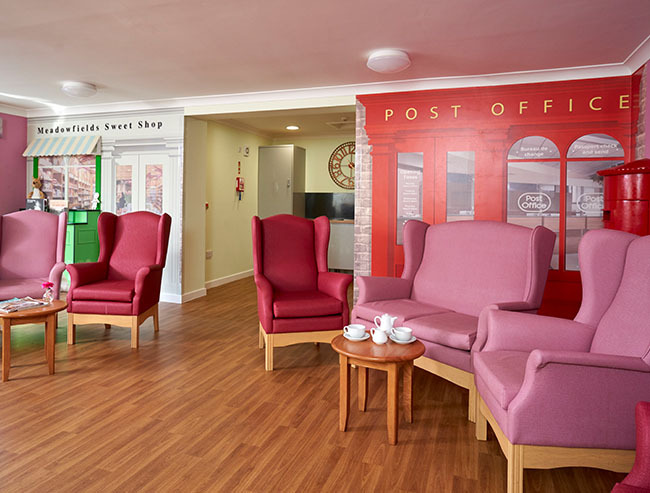 Our homes have been developed and maintained in a way that helps people with dementia. We have specialist signage, to help residents with dementia find their way round. Home environments are designed to be bright and comforting. Safety systems are in place so residents cannot place themselves at risk, and are looked after. Communal areas are uncluttered and spacious, and there are spaces designed for residents to find peace and quiet, if need be. Our homes have secure and safe gardens, both large and small, where residents can sit or stroll around, enjoying the fresh air and sunshine that aides relaxation. We organise special activities for people with dementia. That may be something simple like telling life stories that stimulate memories and help maintain speech skills. We also have a range of physical activities, including ball games and gardening. All our activities are planned and overseen by our dementia specialists, so there is something for all our residents to enjoy each day.